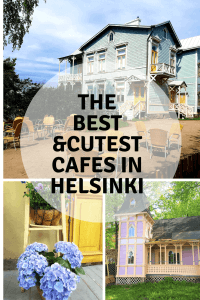 I’ve really taken my time to get to know the best Helsinki cafes. Not just now when I’m back from Thailand but also before my stay in Asia. 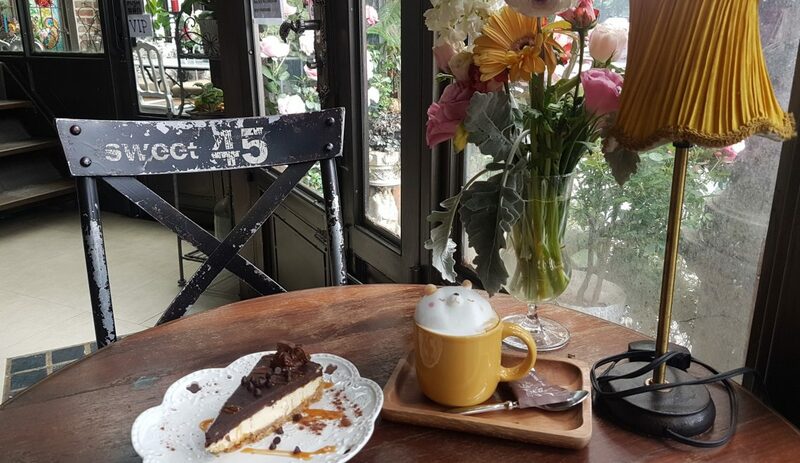 It really is my favourite thing to do, exploring new coffee shops and visiting the old, favourite ones, by myself, reading some magazines while enjoying a latte with something sweet. Lately, I’ve been doing mostly raw food and vegan recipes and I have to admit, I do feel better when I don’t stuff myself with flour, refined sugar, yeast, and dairy. However, I’ve never been a big believer in extremities so I do occasionally allow myself to indulge in pastries, cakes, cookies etc that are the real deal. 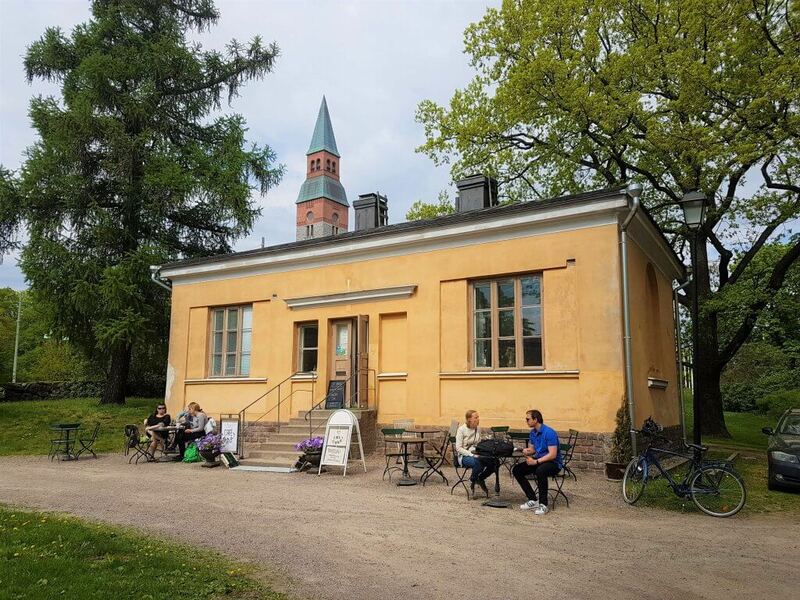 For those wishing to do sightseeing also, have a look at this in-depth article, 25 Free (and Frugal) Things to Do in Helsinki, written by yours truly. 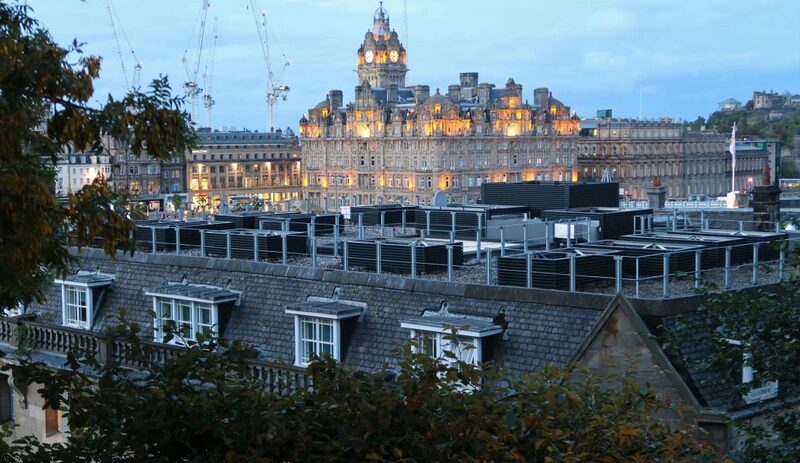 A classic right in the city centre. The cafe lies in a building called, Lasipalatsi (Glass Palace) which dates back to the 1930s and it represents Functionalism at its purest. The building has of course undergone renovations but big changes are not allowed. The same decor continues inside so this is definitely worth checking out if you are interested in architecture. They have the usual cakes, pies, smoothies etc here. Breakfast sets are moderately priced and lunch buffet represents also good value for money. Alcohol is served if you want to come for after work drinks. Hopefully, the inner courtyard terrace gets reopened soon when the Amos Anderson art gallery will be finished. This place can get very crowded during lunch hour but the place is decent sized so you should be able to procure a place. Upstairs you can find a restaurant and a bar from the same owners. 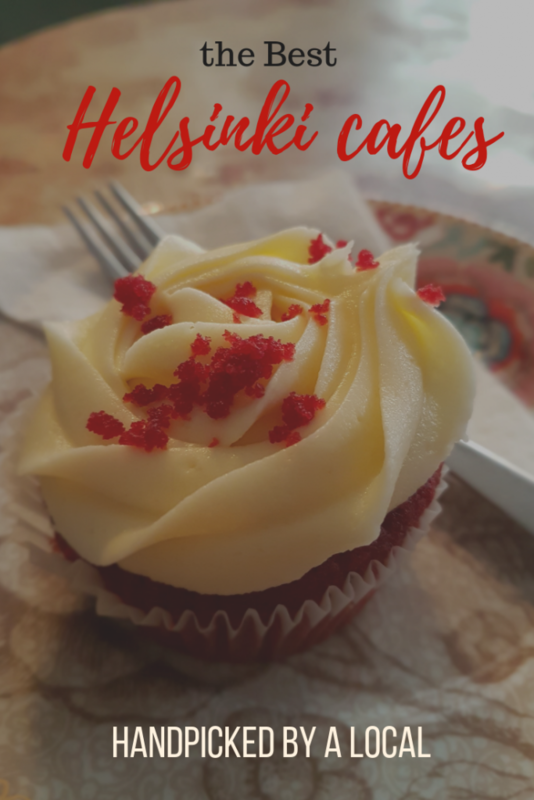 This place ended up on the list because they are a glutenfree cafe! I went to check out the place for the first time and wow! All those delicacies glutenfree. I really wanted to try something but I just couldn’t this time. I had just had a cinnamon roll. Anyway, they also serve glutenfree lunch here, about 10 euros, typically consisting of 2 choices, such as a soup or salad or other warm dishes. Fazer is not just a cafe in the heart of Helsinki. 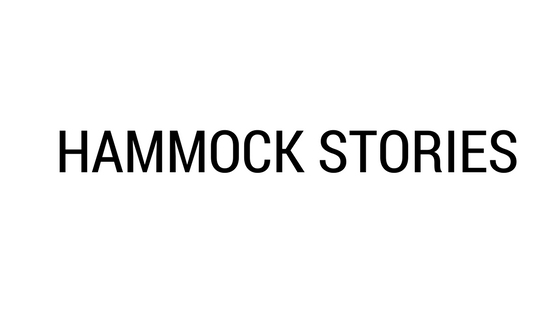 It’s a brand which every Finn knows. They make the infamous Fazer chocolate which is the most popular Finnish chocolate. You really have to try it. But that’s not all. They make all kinds of sweets, bread, bakery products, cakes and so on. The history dates back to 1866 when Karl Fazer was born. Even though he was born to a wealthy family he chose to travel overseas to master the fine art of a confectioner. 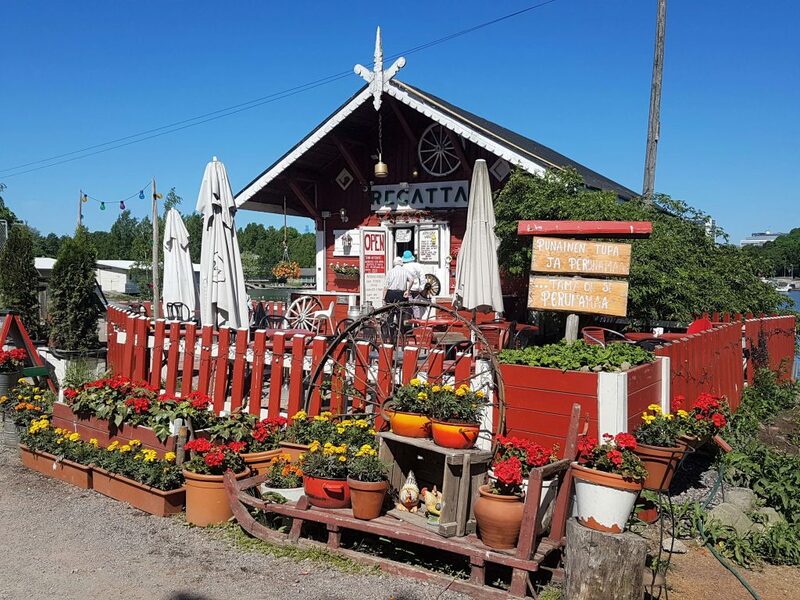 When he returned to Finland, he opened a cafe which became an instant hit. His bakery products were well-known but even more so, his sweets, and the legacy lives on. That’s why I would recommend visiting Fazer Cafe (Kluuvikatu), even just to see the beautiful shop with all the skillfully set displays and Fazer products. 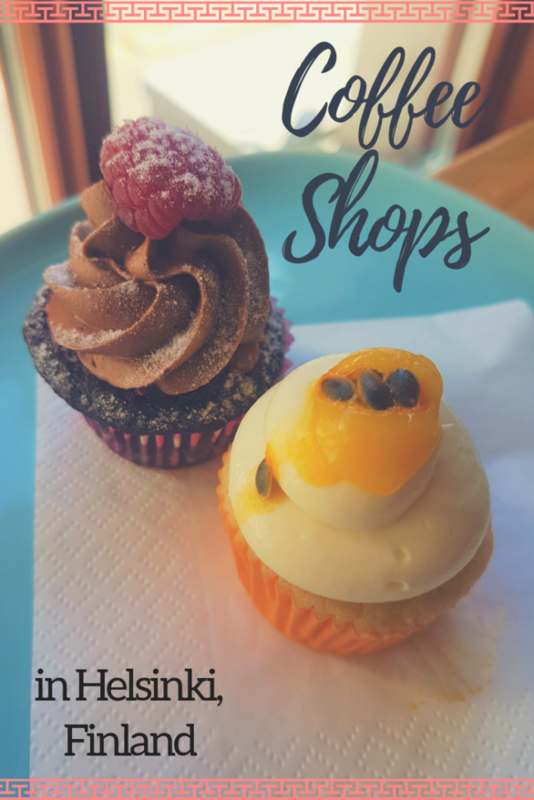 Naturally, I would recommend sitting down to enjoy their bakery products but if time is of the essence, at least pop a short visit. According to its website, the building in which Café Engel is located is one of the oldest in Helsinki. The ground floor was built in 1765 and later on, 2 floors were added. The famous architect, Carl Ludvig Engel designed the facade. His influence can be seen all around the Senate Square. 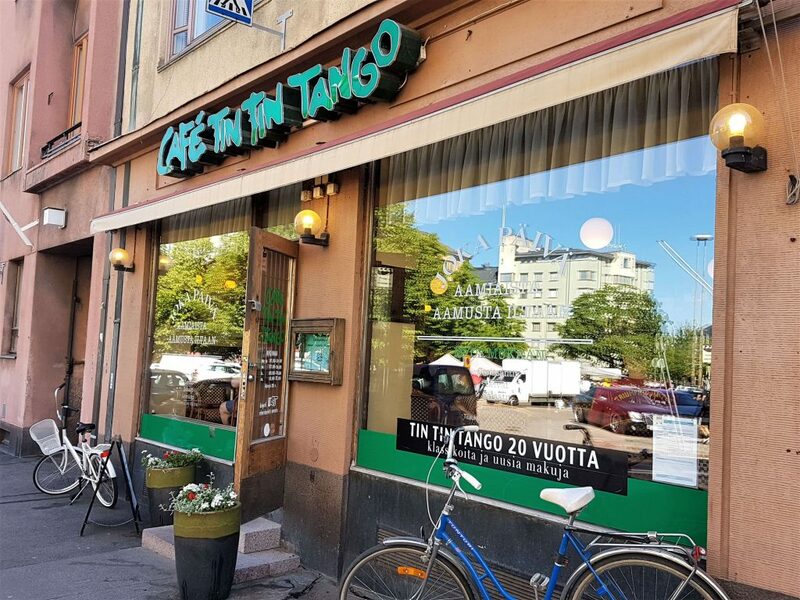 Cafe Engel is one in the series of old-standing and old-fashioned cafes in Helsinki that you can read about in this post. In the inner courtyard, there is Kino Engel, where they show old films and documentaries, in summer and autumn. This place is adjacent to Tuomiokirkko or Helsinki Cathedral, which makes it very popular with tourists likewise. The ambiance is sophisticated and takes you back in time, as is only appropriate, given the location next to the Senate Square. Lovely cakes and delicious lunch guarantee this place gets packed easily. 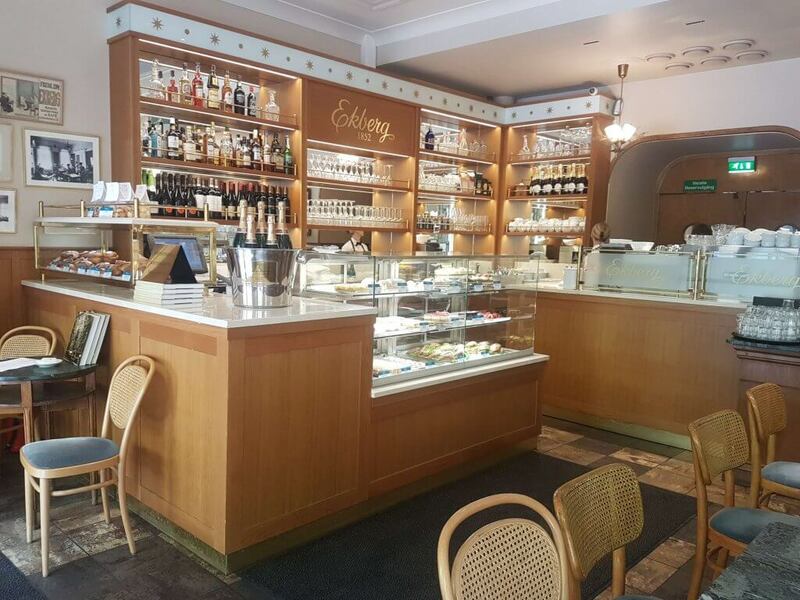 An established place serving people at Etelä Esplanadi, in the heart of Helsinki. This place has got a cafe downstairs and a dining area plus a library bar upstairs. Waiters wear proper black and white uniforms and the place has got grand, old-fashioned decor. 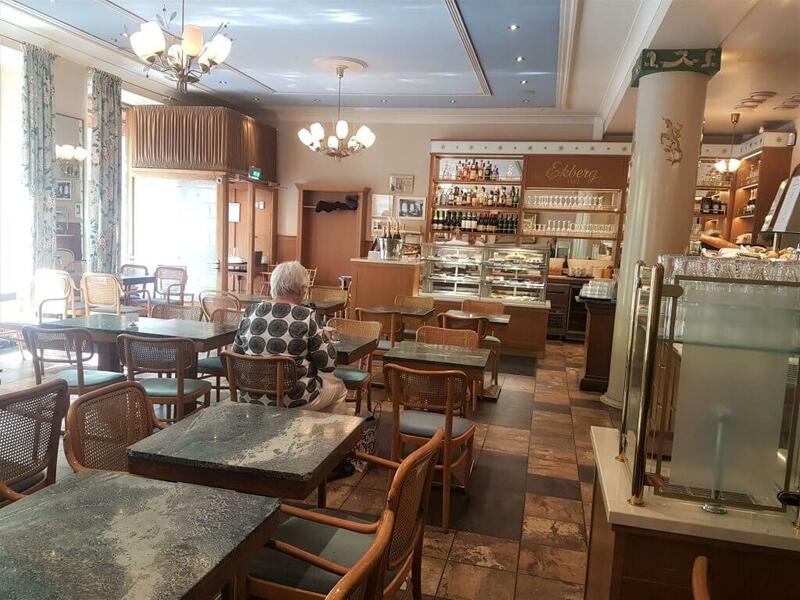 A popular place for older ladies to chat with coffee and a piece of gateau, stylish office workers to have a salad or older gentleman reading their newspaper. All in all, a versatile place that suits for different occasions. The terrace facing “Espan puisto” (Esplanadi Park) is also very popular. An institution at Bulevardi street which has been serving the people of Helsinki since 1852. You notice the prestigious substance of this place once you walk inside. You can see many affluent older ladies and gentleman here. I’m pretty sure a lot of them have been coming here since they were young. Anyway, this place has got character and the products are no second to the ambiance. 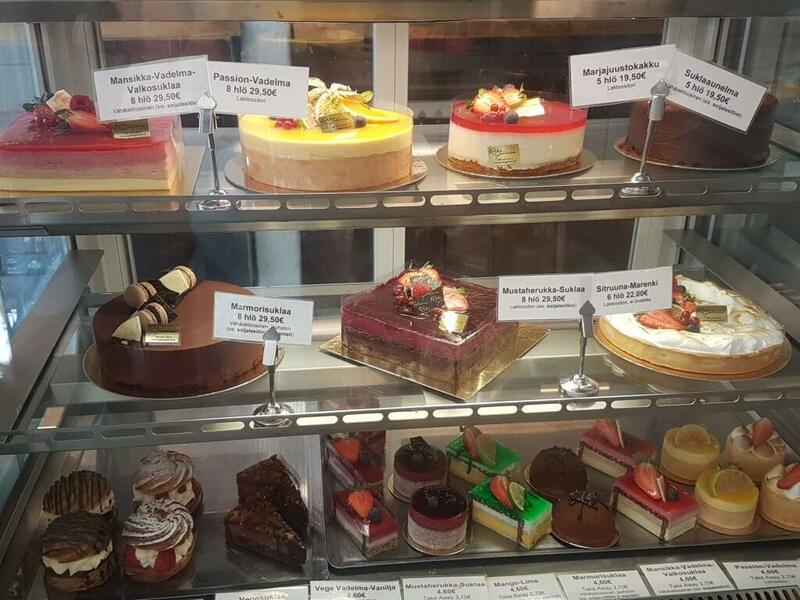 Products, such as bread and marvelous tarts and cakes are baked fresh daily. Breakfast and brunch are very popular here but their lunch is also worth checking out. A while ago, they opened a refurbished bakery/ deli next door so you can buy your picnic treats here if you don’t want to eat in. If you are aiming at sugar high, look no further! This place on Freda (Fredrikinkatu) has got the most fantastic cake buffet ever. With only 12,5 euros (includes tea or coffee), I think it’s a bargain! I’ve done it only once but I think I need to reschedule soon. Tips from a pro: share the pieces of cakes with a friend so you are able to sample even more varieties (you need to finish your plate before going for seconds). A couple of vegan alternatives also available. But, you can also enjoy just one piece of cake with a cuppa. You don’t necessarily need to go crazy here (unless you, of course, want to). Th original shop/bakery is just around the corner but that’s more like just the actual bakery with a few chairs if you want to have a quick coffee fix. 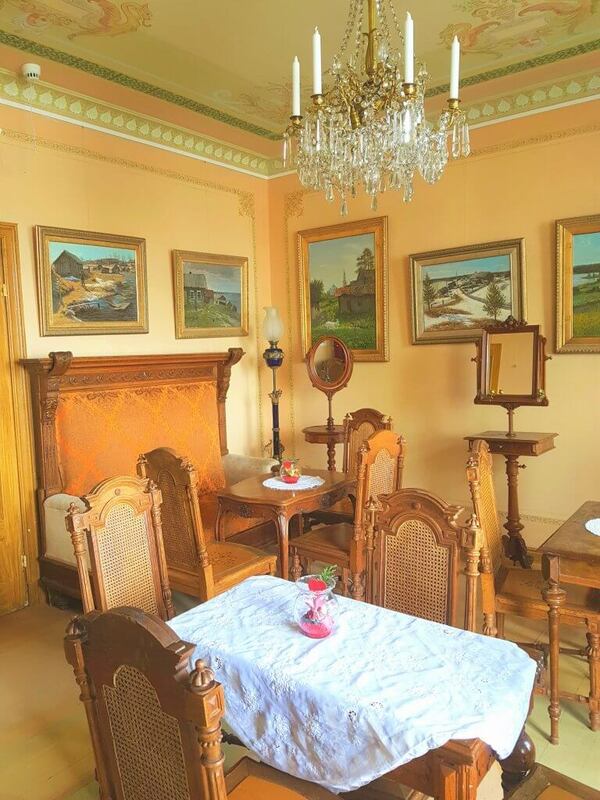 It’s in a beautiful house though so it might be worth checking out if you are around Bulevardi (street). I once ordered my birthday cake from there and it was definitely worth every cent. 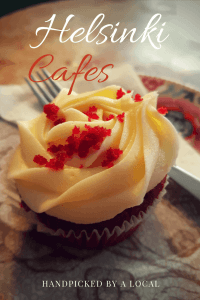 Two sisters from Brooklyn, NY, who were missing their bagels, muffins and cupcakes, opened this coffee shop in 2011. The place became quite popular and the cafe needed to extend to satisfy the need for these sweet and savoury munchkins. 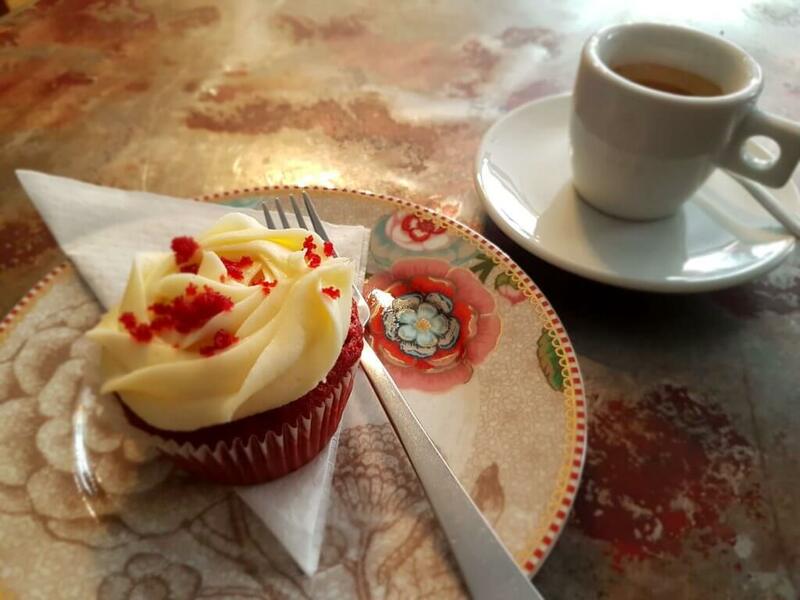 I had a glutenfree Red Velvet cupcake which literally melted in my mouth. The espresso was of high quality as well. Also on the menu is salad, avocado toast, yogurt parfait and on the weekends, waffles. Drink menu consists of coffees, tea, milkshake, freshly squeezed juice and the smoothie. You can also order their fab products because they have a bakery taking orders to your liking. A true gem at Korkeavuodenkatu, a sophisticated, French-style cafe that has been operating since 1957. The owners also have Cafe Esplanad which is a bigger version of this, at Etelä Esplanadi, closer to the city centre. I used to work at Cafe Success a long, long time ago. Their korvapuustis (cinnamon roll) are very famous and they probably started the trend of offering huge örfils (its Finnish Swedish name). Toscawiener is another classic that will surely please anyone who likes sweet pastries. 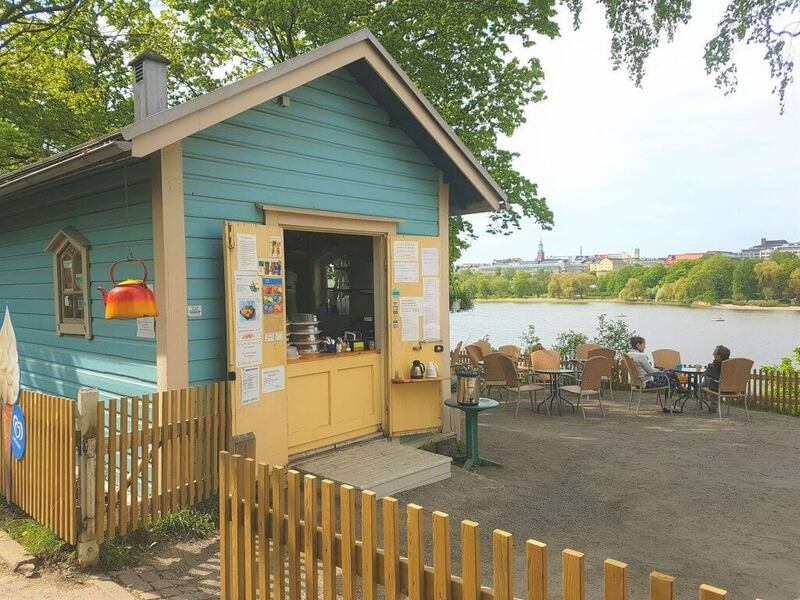 A classic cafe in the southernmost Helsinki, by the seaside which is owned by a group of social field associations. Therefore, the returns are directed at doing good rather than expanding someone’s own pocket. A very popular place especially on the weekends with various people, older and younger, locals and tourist, not forgetting dog owners either. 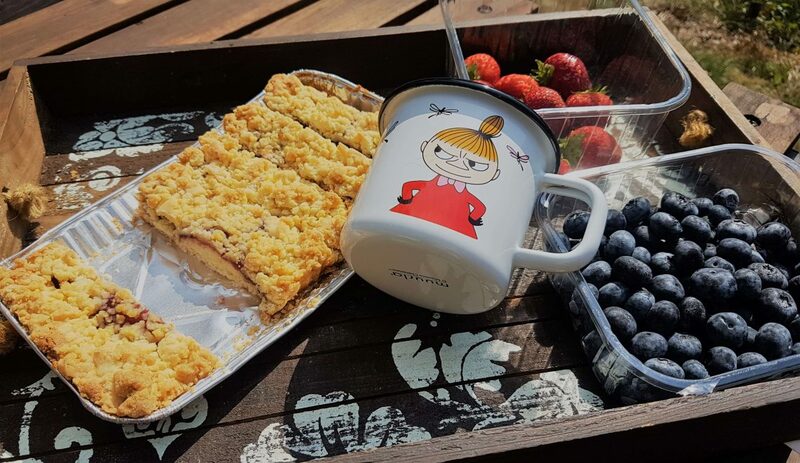 Products are fantastic, and they have a variety of salty dishes as well as sweet cakes, tarts, cinnamon buns (the Finnish classic) and a changing lunch menu. On the weekend, they have a lovely brunch. Alcohol is served if you’d prefer having a glass of wine rather than something sweet. A cool spot for watching the world go by. They describe themselves as a champagne bar but I decided to include it on the list, nevertheless. Draws a younger, hip and posh crowd. Some sweet and savoury foods are available though the emphasis, I think, is on drinking cider, beer or sparkling wine to lighten up your day. Sometimes there is a dj playing trendy lounge music or house which adds up to the whole experience. This cafe is just beautiful architectonically. The wood planks are charred, giving it a shiny and black finishing. There are seats inside but the main function is the terrace on the outside (weather permitting). Birgitta caters for many different tastes but a lot of the crowd is youngish and/or affluent people from the neighbourhood. They offer a variety of bakery products that are baked daily but also food portions. There is one salad and one burger for lunch, one portion always suitable for vegetarians. You can find good coffee here but this place is also very popular for having some cider at summer or even a glass of champagne. Opens in spring when it starts getting warm and closes its door when it starts getting too chilly in autumn. A true gem only about 20 minutes walk from the city centre. It’s on a hill slope so you can see the waters of Töölönlahti (Gulf of Töölö) and the city silhouette in the background. No cars to be seen nor heard. Just serenity, birds singing and people enjoying the beautiful view. Now when I revisited this place, I was happy to notice that they had added some dog biscuits etc for your furry friend, and my favourite actually was, ice-cream and dog biscuits on the side, hehe. During the summer, ice-cream is a popular choice but they do make awesome sweet and savoury products or you could try out their soup that is served lunchtime. 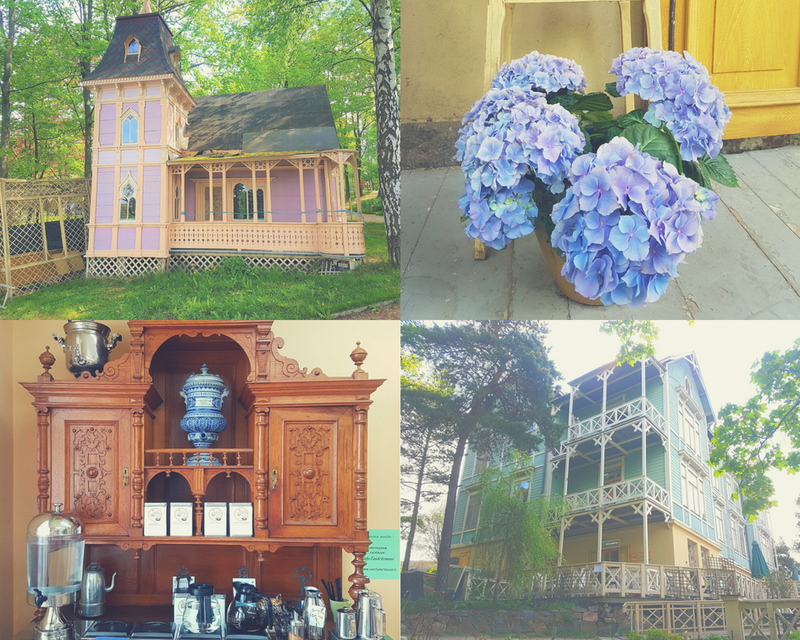 This one is next to Cafe Linnunlaulu, in a beautiful, old wooden house called Sininen huvila (Blue Villa). It has got inside seating as well, on top of the big patio where you can also admire the view down to Töölönlahti. The baker makes all of their products daily. I decided to try the vegan cinnamon roll and it passed the test. The cinnamon roll/bun, or korvapuusti, is pretty much like the national sweet dish of Finland. My Mum actually might be the biggest consumer of these in Finland, haha. And I don’t say no either when there’s one on offer. One of my favourite cafes in the Kallio neighbourhood. A very cozy place which fills up quite fast. Products tasty like Mum would’ve made them at home. Prices are fair, eg. both soup lunch and omelet are 7,5 euros. Pasta around 9 euros. You have to pay your coffee separately though (1,5 euros) if you have it with lunch so that’s a downside. Pies, cakes etc are always delicious! 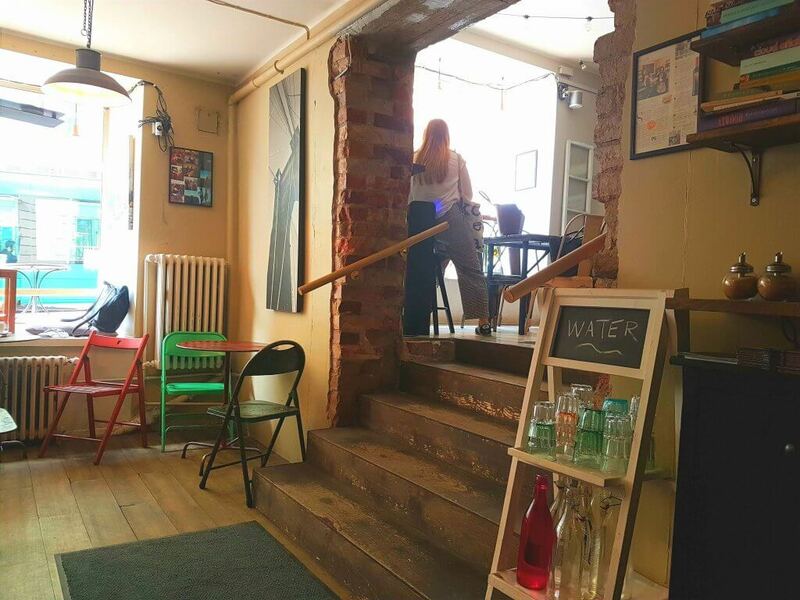 This Kallio cafe has also its own yoga studio! The menu is completely vegan yet so delicious. Ok, I haven’t actually tried their lunch yet but I’ve seen it looks super healthy and tasty. 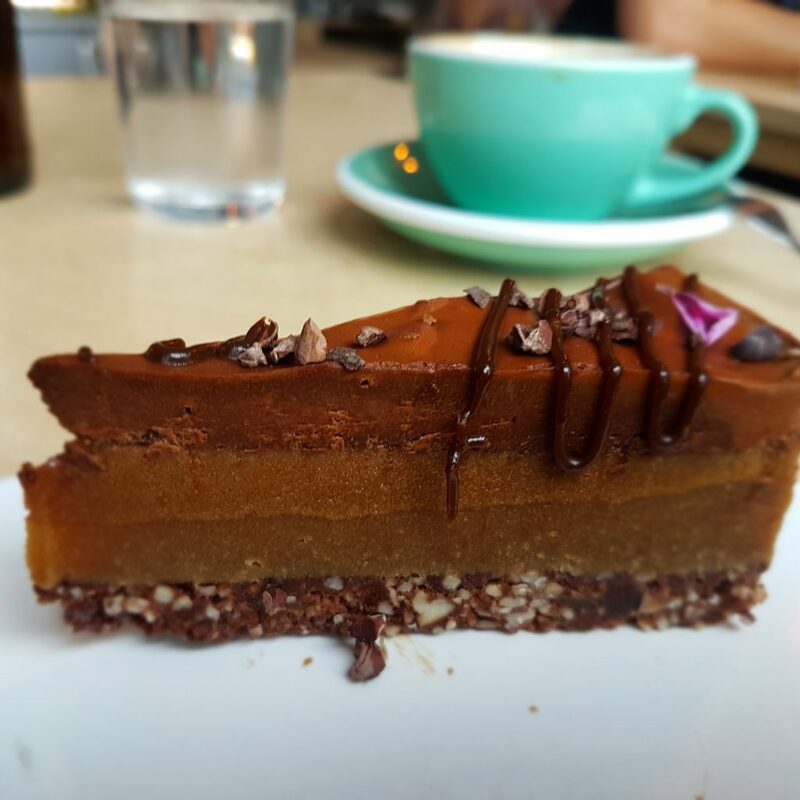 I’m a sucker for raw cakes so you get the drift. I like their specialty for creative working people as well: for 7,5 euros you can work there at designated tables from 8-11, get a power socket, internet connection and limitless amount of tea and coffee. The most delicious raw cakes ever! 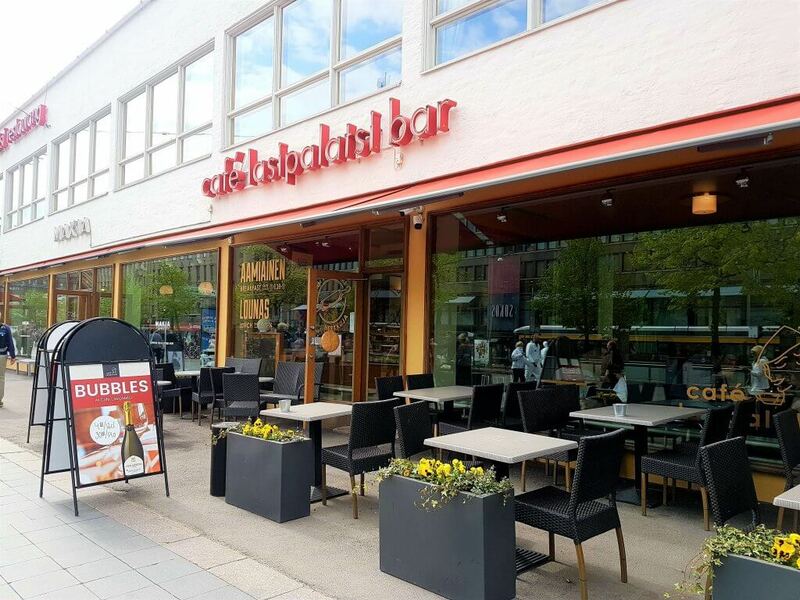 A classic cafeteria in Töölö, a 10-minute stroll from the city centre. The interior and music make you think you would be in Paris! The breakfast sets represent good value for money (6-11 euros), in my opinion. Not everyone wants to stuff themselves with an all you can eat brunch though occasionally that is the best thing on a Sunday. While you are enjoying your coffee with something sweet or having that lunch salad you can also do your laundry here. Talk about time management! 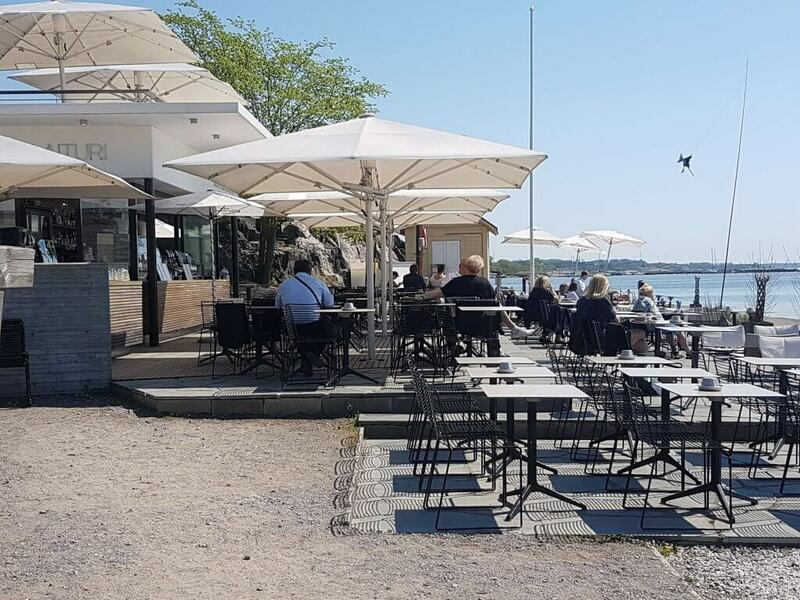 What would be a list of the best Helsinki cafes without the infamous Cafe Regatta by the seaside? Well, it would be short-handed! This cute red hut is a cafe institution! It is a little bit out of the way but certainly worth a visit. Close to Cafe Regatta is also the Sibelius monument (5 minutes walk) if you’d be into that. 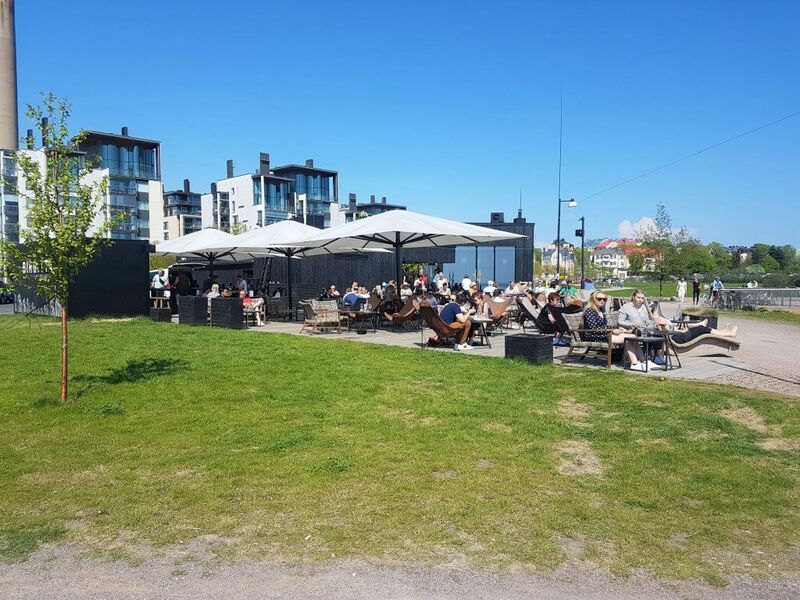 This cafe is very popular on Sundays when people stroll around the Merikannontie area, either enjoying warm and sunny summer days or cold and beautiful winter nights. Warning: it can get very busy and you might need to wait for your turn for a while. Luckily the outside seating area is big if you don’t fit inside the old and quirky hut. On the outside, you can grill sausage and enjoy the warmth of the bonfire. Once again, the korvapuustis here are so tasty! If you want to get active, they rent SUP boards, kayaks, canoes and rowing boats. What’s more, the cafe is open 365 days a year! 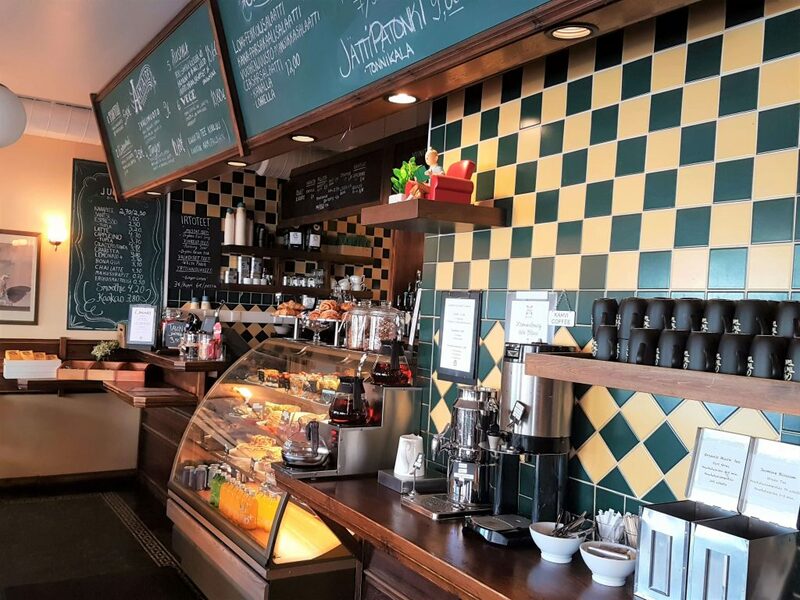 Ok, have you found your favourite yet, of these fantastic Helsinki cafes? Or do you think there is something missing from the list? In that case, please do tell me! I’m wishing you relaxing moments with a cup of mocha, tea or a glass of champagne! 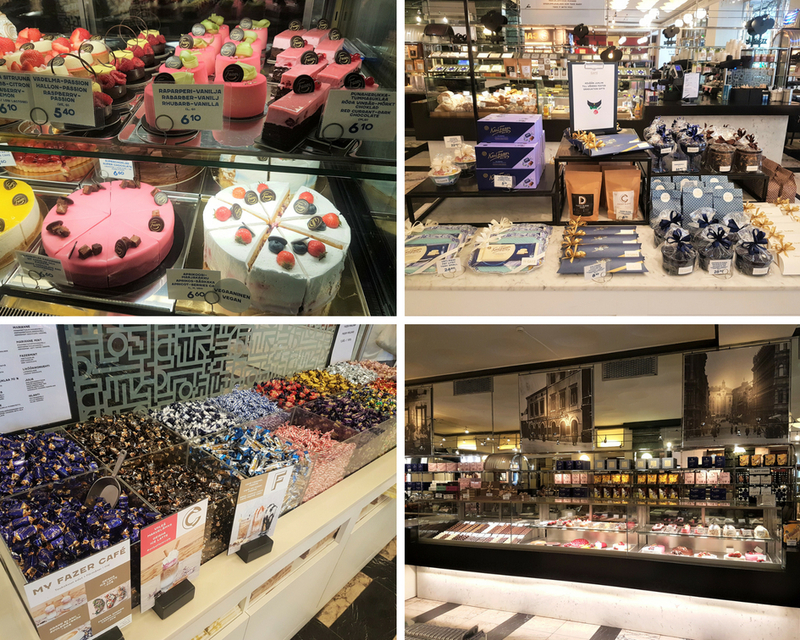 PS If you love everything sweet, perhaps this post on the exquisite chocolate buffet in Bangkok might interest you.